This article covers how you can configure your help desk to get real-time Email alerts. Be it on your desktop computer, cell phone, or any other mobile device, you can now remain connected to your Customer Support anywhere. WSDesk, with the help of Triggers, sends email notifications whenever a customer creates a ticket. Not only customer’s action, but a Support Agent’s response to the ticket or even a change in ticket status can trigger the emails. So let us start with the process. Based on these two events, Email notifications should be sent. Since we have figured out what to do, let’s create a trigger. This trigger is named as Email Notification. Based on the conditions and the action, the following screenshot shows how the trigger can be created. Since for both the conditions the Client should receive notifications, go with the OR Condition Format. After configuring both the conditions and activities, let’s make an email template for notifications. This Email template will automatically insert the necessary content that you want to display in the notification. Since everything is configured, let’s see what happens when a ticket is created. As soon as the customer creates a ticket, it will activate the trigger. And all email recipients will receive an email notification. Similarly, when the ticket status changes from unresolved to pending, WSDesk will send an email notification. I hope this article has helped you in understanding how easily triggers can send email notifications to Admin as well as any Support Agent regarding support tickets. But this is not the end to triggers. WSDesk uses triggers to perform a variety of other automated tasks. 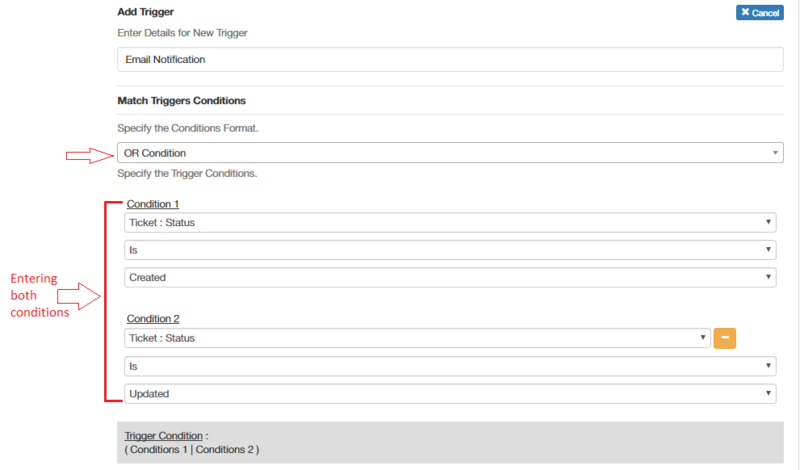 Read more to know about how you can use triggers to automate ticket assigning.